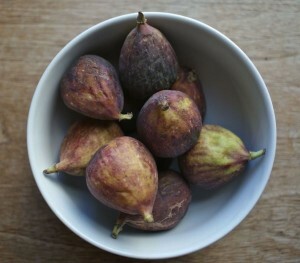 One of the most splendid treats we enjoy in our future home of northern California are fresh figs! If you are lucky enough to have seasonal access to these little gems, count your blessings! Figs cannot withstand temperatures much below 20°F, and so are not available from local sources in much of the Midwest and northeastern U.S. In other words, it’s rare to find them in our local markets in Minnesota! They have two seasons. A quick, shorter season in early summer and a second main crop that starts in late summer and runs through fall. 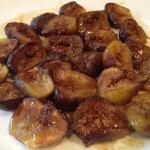 Last summer I was thrilled when I found “Brown Turkey Figs” at our local Costco! Though I was unable to pick and choose my own fruits because they were sold in bulk, I was fortunate that the quality was perfect! Figs are fragile so if you have the opportunity to choose your own fresh figs, look for slightly wrinkled (but still plump) and even split figs (as long as they are not weeping or leaking). You also want a bit of bend at the stem and a slight weariness to the skin. Figs don’t last long either! If you do manage to get your hands on some, you should share some and/or plan on eating them within a day or two of buying them. They keep best at room temperature with plenty of air circulating around them (leaving them out in plain view also reminds me to use them! ), but they will keep a bit longer in the refrigerator. Know that chilling may reduce some of their full flavor, so try to avoid it. 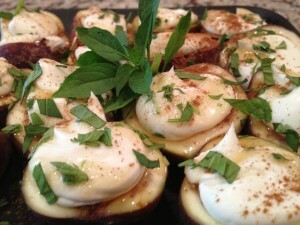 I prepared them a couple of ways including preparing them raw with the Marscapone (pictured at the bottom of the blog with a drizzle of honey, a sprinkle of cinnamon and fresh basil! ), sliced simply added to salads, and finally this dish of roasting them when they were just starting to become slightly soft. Brown Turkey figs have brownish-dark purple skin, a milder flavor than other figs and are noticeably less sweet than the similar-looking Black Mission figs. This variety works well in salads or in desserts where a sweetener will be used. 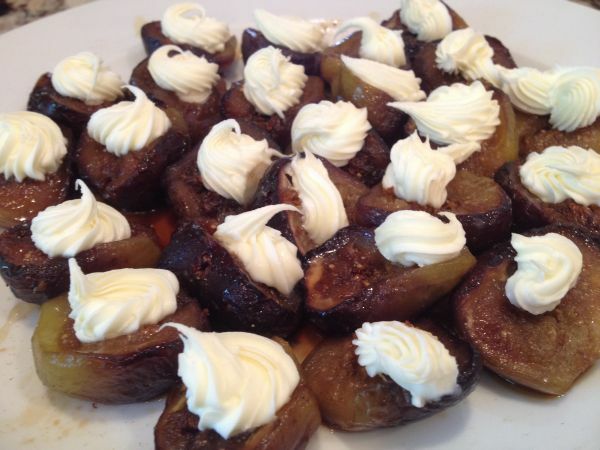 In California, I can also easily find Black Mission figs, which are extremely sweet (sometimes they even ooze a bit of syrup so I omit the honey) and thus are perfect for serving plain or the tangy fresh cheese such as marscapone and eaten as a dessert. The Black Missions have blackish-purple skin and dark pink flesh. Each are delicious! 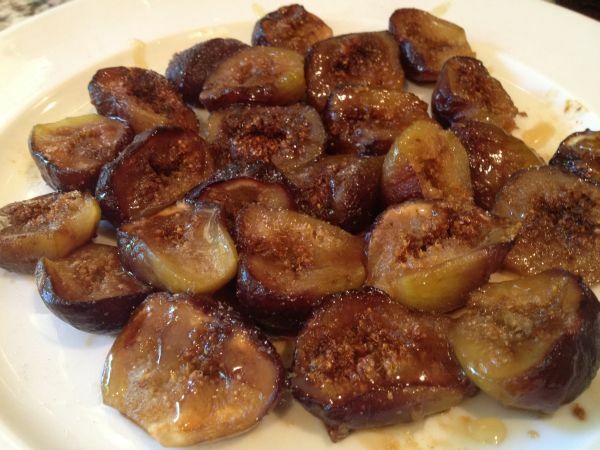 To prepare the roasted figs, gently clean them with a quick rinse of cool water and removing the stem. 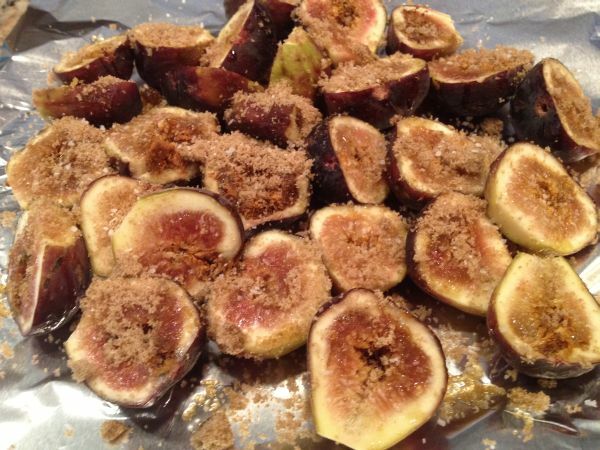 Cut the figs in half and lay them on a baking sheet. Drizzle figs with honey and top with brown sugar. Broil until the tops bubble and start to brown on the edges. Remove from the heat and allow to cool. Mix the marscapone and creme fraiche with a mixer until smooth. 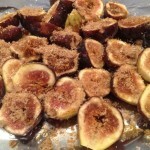 Use a pastry bag to pipe onto each fig and enjoy them eaten slightly warm or at room temperature. For the more savory serving, halve the figs lengthwise and serve with drizzled honey, small dollops of marscapone mixed with crème fraîche, and sprinkled with cinnamon. Top with a chiffonade of fresh basil!